Ahmed Aboutaleb (born 1961 in Beni Sidel, Morocco) has been Mayor of Rotterdam since 2009. Previously, he represented the PvdA (Labor Party) as State Secretary for the Ministry of Social Affairs and Employment in the fourth Balkenende cabinet (2007-2008) and as an alderman in Amsterdam (2004-2007). At the age of fifteen, Aboutaleb came to the Netherlands for family reunification. The family resided in The Hague, where Aboutaleb successively attended Junior Technical School, Intermediate Technical School and Technical College, graduating in Telecommunications in 1987. Ahmed Aboutaleb is a poetry enthusiast. In the mid-1980s, Aboutaleb started his career in journalism. He was a discussion leader for RVU Television, made programs for Radio Stad Amsterdam and Radio Noord-Holland, and reported for Veronica Radio, NOS Radio and RTL News. In 1991, he moved to public services, holding positions with the Ministry of Welfare, Health and Culture, the Social and Economic Council of the Netherlands (SER) and Statistics Netherlands (CBS). In 1998 he became an administrator for the Forum Institute for multicultural development, and in 2002 he became director of the City of Amsterdam’s sector of Social, Economic and Cultural Development (MEC). 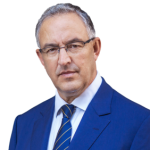 Mayor Aboutaleb strongly advocates the values enshrined in the Dutch Constitution: freedom of religion, freedom of speech and the principle of non-discrimination. In his view, obtaining Dutch citizenship entails a responsibility to respect and uphold those values and to take part in building the We Society. The more people take part in which, the stronger and more resilient that society will be, both in good and bad times. He’ll regularly take neighbourhood strolls throughout Rotterdam to have talks with residents about what concerns them. In 2015, Aboutaleb published two books: an HJ Schoo Reading (published by Elsevier magazine) titled De roep van de stad (“The City’s Call”), covering the leading role cities and urban regions can play at the national and international level, and Droom & Daad (“Dream & Deed”), which was published for the History Week of the Collective Promotion of the Dutch Book foundation (CPNB). In Droom & Daad, he tells a Rotterdam war story to present how to ensure a stable, peaceful society.